It was time to get gritty. 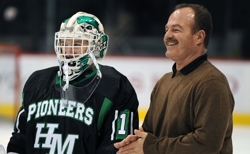 Hill-Murray was trailing Minnetonka by a goal after two periods in the Schwan Cup Gold Division championship, and Pioneers coach Bill Lechner had seen plenty of fancy stickhandling from his forwards but not much in the way of results. The Pioneers, with perhaps the deepest pool of high-end forwards of any team in the state, proved they have some heart and desire to go with all that flash and flair en route to their 5-3 triumph over the Skippers. Sophomore Zach LaValle, in particular, took Lechner’s words to heart. He scored two of Hill-Murray’s three third-period goals – including the game winner. “Coach just came into the locker room and he told us we had two options, we could give up and go home or we could wear our black jerseys with pride and go to the net,” LaValle said. LaValle went to the net. LaValle’s second goal was much like the first. He crashed the net and banged in a rebound. “They won’t be on Sportscenter?” Lechner said about LaValle’s crash-and-bang goals. “No. But that’s OK.
Lechner was carry the Gold Division’s championship trophy as he left the Hill-Murray locker room, “Not the one we’re looking for, but we’ll take it,” he said. Of course, Lechner was referencing the state Class 2A championship, a title the Pioneers seemingly are in contention to win every year. With three lines regularly producing goals, a defense led by standouts J.D. Controneo and Kevin Schulze and Tim Shaughnessy providing high-level goaltending, Hill-Murray certainly has the look of a title-worthy team. After a 1-2-0 start, the Pioneers have won seven straight (counting a tournament shootout victory over Edina) and climbed from No. 10 to No. 5 in the state Class 2A rankings. They could move even higher, perhaps all the way to No. 1, with a triumph over No. 1 Eden Prairie on Thursday. “It’s a good start,” LaValle said about the Pioneers’ first Gold Division title. “We’re where we want to be right now, but we’ve got a long way to go come March. In this week’s Class 1A rankings, St. Thomas hangs on to the top spot but look out for undefeated Hermantown (9-0-1), which has climbed all the way to No. 2. The Hawks host No. 9 Duluth Marshall on Tuesday. All of the state's top big-school teams have at least one loss, so Eden Prairie vaults to the top based on its dominating run to the championship of the holiday tournament in St. Louis Park. Matchup with No. 5 Hill-Murray on Thursday has all the ingredients of, dare we say, an instant classic. The Hornets have been far from dominant, as eight of their 10 games have been decided by a goal or ended in a tie. Still, Edina squared off against three of the state's hottest teams last week (Duluth East, Hill-Murray and Blaine) and beat or tied them all (not counting shootout losses). The Red Knights suffered their lone loss last week in run-and-gun shootout with Eden Praire. Wins over Elk River and Centennial were suprisingly tight. This is team, when matched up against quality opponents, that does just enough to win. That's not a bad quality. Upcoming schedule gets considerably weaker. After reeling off 10 straight victories to start the season, the Trojans stumbled at the St. Louis Park holiday tournament with consecutive losses to Moorhead and Maple Grove. Their only game this week is a tough one, as Lakeville North and star goaltender Charlie Lindgren has given several top-10 teams fits this season. Hottest team in the state? Well, the Pioneers have won seven straight, including a gritty come-from-behind triumph over Minnetonka to earn the Schwan Cup Gold Division title. A victory over Eden Prairie in Thursday's showdown at Aldrich Arena could vault Hill-Murray all the way to top spot. The Greyhounds' two losses have come against state big-school superpowers Wayzata and Edina, and both of those were by a single goal. Duluth East still needs that season-defining win, and Jan. 15 matchup against Eden Prairie provides opportunity to rocket up rankings. Like Eden Prairie and Hill-Murray, the Wildcats also emerged from the holidays as a tournament champion. Eagan won the South St. Paul Holiday Tournament with a 4-1 triumph over the host team in the title game. The Wildcats won their three tournament games (they also beat quality North St. Paul and Woodbury teams) by a combined score of 16-1. The Eagles haven't played a top-10 team since losing 5-3 to Wayzata on Dec. 14, so their matchup Thursday with South Suburban Conference foe and No. 7-ranked Eagan will say much about where they fit in the top 10. Dynamic duo of Hudson Fasching and A.J. Michaelson have combined for 48 points. The Thunderhawks' prolific offense was slowed considerably in their last two games, a 2-2 tie against Lakeville North and standout goaltender Charlie Lindgren and a 4-3 overtime win over Mahtomedi. Grand Rapids still is scoring 5.5 goals per game, an output that ranks among the top 20 in the state. The Crimson have alternated wins and losses in each of their last four games, but their last win -- over previously No. 1-ranked Wayzata -- was good enough to power them into the top 10. Talk about depth, 11 Maple Grove players have at least two goals. Yes, the Cadets have three losses, but two were in overtime to Class 2A power Minnetonka and the third came against No. 6-ranked (Class 2A) Duluth East. Defensemen Eric Schurhamer and Taylor Fleming among the Cadets' biggest offensive threats, as they have combined for five goals and 12 points. One of three unbeaten teams left in the state (Litchfield and Totino-Grace are the others), the Hawks have defeated most every top team in northeast and northwest Minnesota. Another top foe looms in Duluth Marshall on Tuesday. Looking further ahead, current top-10 Class 2A teams Grand Rapids (No. 9) and Eden Prairie (No. 1) also are on the schedule. The Mustangs had a rough holiday "break" as they went 0-3-0 against big-school competition in the Schwan Cup Gold Division. Goaltender Max McCormick had posted four shutouts in five games before allowing 15 goals in the three tournament losses. The Eagles finally suffered their first loss during a holiday tournament in Rochester, but they remain unbeaten against Minnesota competition as the lone setback came against Eau Claire Memorial, Wisconsin's No. 1-ranked team. Lourdes' usually above-average depth has been depleted by a recent rash of injuries. Will the real Bears please stand up? In the Schwan Cup Silver Division, Blake skated to a 3-3 tie with tough Roseville (then won in a shootout) before suffering a humbling 7-0 loss to eventual tournament champion Holy Angels in the semifinals. The good Bears showed up in the third-place game, beating Stillwater 3-1. The Bluejackets had scored 36 goals in their previous four games before running up against Lakeville North and standout goaltender Charlie Lindgren in an eventual 6-2 loss. Adam Johnson and Nick DeCenzo rank No. 1 and 2 in the state in scoring with 43 and 42 points, respectively. The Blue Devils have had more ups and downs than an elevator operator, but those swings are the byproduct of a schedule that features quality opponents at most every turn. Schedule gets a bit easier leading up to huge Iron Range Conference games against Hibbing and Grand Rapids. Undefeated and mostly untested, the Eagles biggest win might have been their most recent, a 4-1 triumph over rival Spring Lake Park on Dec. 23. This week will be a tough one, with road games against Mahtomedi and No. 5 Blake. Totino-Grace averages 6.29 goals per game, the second most in the state. Hilltoppers are tough team to handicap. They've defeated some solid teams (Mahtomedi, Woodbury) but those wins came early in the season. Talk about a tough week: Showdown with No. 2 (Class 2A) Hermantown on Tuesday followed by road game at No. 9 (Class 1A) Grand Rapids and matchup at home against No. 4 (Class 2A) Rochester Lourdes. Impressive win over St. Cloud Tech pushes the Flyers into the top 10. Little Falls' lone loss came in its second game, a 4-1 setback to Virginia on Dec. 3. Michael Stumpf's .978 save percentage is second-best in the state. His 1.09 goals-against average ranks fourth. Honorable mention: East Grand Forks, Proctor, Thief River Falls, Delano, Warroad.